# 1: What does this traffic sign mean? 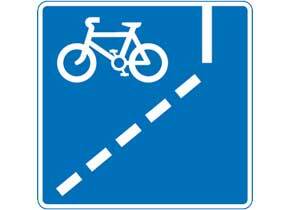 Mandatory with-flow pedal cycle lane ahead. Additional plate may show hours of operation. # 3: Which sign may be placed where pedestrians are likely to be crossing a high-speed road where there is no formal crossing point? Where pedestrians are likely to be crossing a high-speed road where there is no formal crossing point this sign may be used. Other danger ahead conveys no specific message on its own. It is always used together with a supplementary plate, describing the hazard. # 4: Which sign marks a mandatory contra-flow pedal cycle lane? 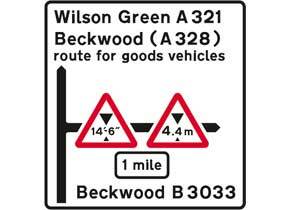 The sign indicates an alternative route (straight) to take to avoid a low bridge. Red rings or circles tell you what you are not allowed to do. 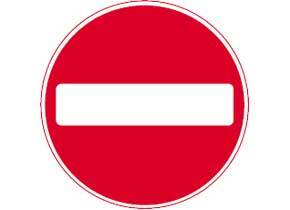 # 7: What does this traffic sign prohibit? The sign prohibits the use of a road by motor vehicles except solo motorcycles. # 8: Which sign tells you that you should watch for pedestrians walking along the road? Where pedestrians frequently use a road without proper footways, this sign is used to warn drivers of the likely presence of pedestrians in the carriageway. # 9: What does this warning sign mean? 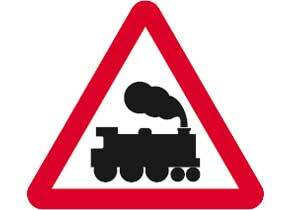 This sign is used in advance of open railway level crossings which have neither gates nor barriers. 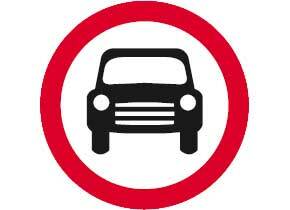 # 10: Which sign means no motor vehicles are allowed? Well done! Can you get the same score on these quizzes? Ooops, you missed a few? Try again and make sure you get them right! Think you can drive and know all British traffic signs? Challenge yourself with this quick quiz. Knowing traffic signs is essential for your Driving Licence test and some of them will appear in the official theory exam. Knowing them is also essential for your safety on British roads. Too many accidents happen because drivers don’t pay enough attention to signs and signals, or simply don’t know the meaning of them. Take on the challenge and make sure you can ace this test! It will help to keep you safe on the road. Traffic signs to study: “Know Your Traffic Signs“. Try some full U.K. mock tests at: Driver’s Mock Test.